Oxygen Not Included is like a kinder, cuddlier Dwarf Fortress. Sure, you’ll still get into a starvation spiral where everyone in your colony dies, but this base-building game looks cute while it happens. 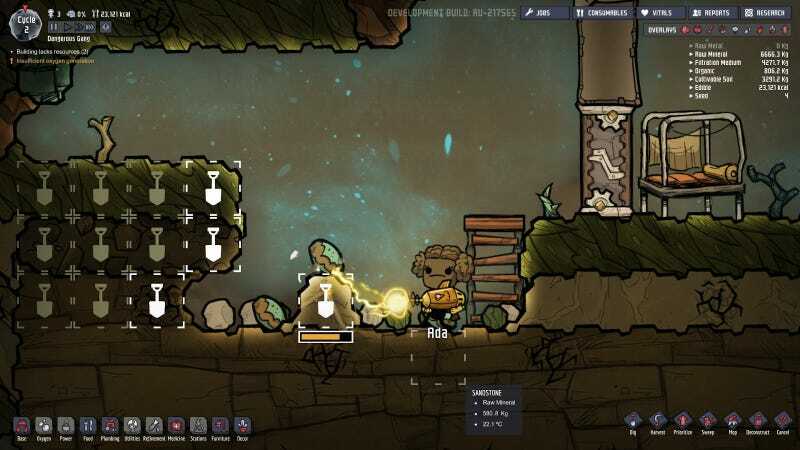 Oxygen Not Included is a game in the vein of Dwarf Fortress or Rimworld—you select some colonists and juggle all their needs while expanding your base on an increasingly hostile world. If Rimworld is Dwarf Fortress-lite, then Oxygen Not Included is Rimworld-lite. The world in which your colonists live is just a bit more hospitable than the ones in Rimworld. While bugs emerge from the ground to rob you of your resources at night, in the 90 minutes I played of the game there were no hostile raids or people snapping and killing the entire colony. When you start Oxygen Not Included, you select three colonists who wake up underground, on a mysterious planet. Each colonist has a range of skills, such as cooking, digging, or athletics. From there, you click and drag on the ground to start digging up resources, which you can use to make objects like toilets, generators and research benches, while also researching ways to make your colonists’ lives better. From there, the needs keep compounding: you might find yourself figuring out what resources you need to make the new planter box you’ve just unlocked, and then you start digging again… and so on. All the while, you have to make sure your colonists can breathe, go to the bathroom, relieve stress and and eat. The game is an endless chain of improving the quality of life of these guys and making sure they’ve got enough supplies. All the micromanaging I’ve seen thus far in Oxygen Not Included makes the game seem pretty complex. Oxygen really isn’t included in this colony—there’s an overlay that measures the oxygen concentration levels, and if your colonists are inhaling too much CO2, their health will start to go down. You can create more oxygen by planting plants, or finding gas pockets in the walls and pumping that into your colony. You’ll also need to lay down pipes for plumbing, and have a colonist for researching, and a guy to run on a treadmill to generate electricity. I can see in my mind’s eye the purely efficient colony I can build in this game—the farms, the wells, and the oxygenated rooms—and I’m incredibly excited to start building it. As I was playing Oxygen Not Included in the office one of my coworkers came to kick me off the computer. For a second, to my shame, I was actually mad about it. No, I wanted to say, I’ve just figured out the economies. I’m just getting to the good part! The game isn’t easier than the ones it’s inspired by, per se, it’s just cuter. All the actions you can do have associated beeps and bonks (I especially like the clown horn-y sound effect for canceling a task), and the randomly generated colonists have wiggly, Saturday morning cartoon animations. It’s easy to love these little guys. When they start choking to death because there’s no oxygen, obviously that’s gonna hurt. But I never felt like the game was grimly waiting for me to screw up and for the colony to implode. Although, I am interested in the “Stress Response” that each colonist has. Most of the ones I generated would apparently vomit due to stress. You and me both, little guys. If you’ve never played a game like Dwarf Fortress before, then Oxygen Not Included is a good place to start. It’s a friendlier, more approachable version of that kind of game. It doesn’t seem to lack challenge, however. I can already see the places where my well laid plans will probably fall apart. The game is in Early Access and costs $25 on Steam. As soon as I get home from work I’m going to start playing it again.